I sometimes feel that I don’t live simply enough. I feel like I have so much abundance, it might even be too much. I lived in the world I now criticize for many years, though I was never comfortable in it. I used that system just enough to get to where I could leave it. I was in my early 40’s. At the beginning, I was simply ignorant and following the ‘American Dream’ like I thought I was supposed to. For years, I worked as a designer helping people create wonderful spaces, and loved the creative process; but I always felt that it was so much for nothing. A lot of what I made money on was contributing to the unsustainable system we are now engulfed in and I could feel it. I did, however, live in a tiny, tiny (about 400 sq ft at most) apartment for 20 years. I only bought a house, after my mother passed, when I had accumulated enough to make a sizeable down payment toward what I thought would be future security. I was lucky enough to come out less scathed than many. Timing is everything. Last night I made the mistake of visiting some of my old friends on FB that have achieved great monetary success and started to feel a sense of failure. I started feeling a little shame about the condition of my dilapidated home. I always come full circle after an episode like that and realize that I am exactly where I want to be. I get up every morning with something wonderful to tackle. The fact that I have to find unconventional ways to accomplish most things just adds to the adventure and resulting sense of achievement. I guess for some, the achievement of so-called wealth is the goal; the material elements just an outward expression of that. This particular person won’t read this, I’m sure. We’ve lost touch. We were roommates for a couple of years when we were in our 20’s. Even then, it was evident that nothing was enough for her. I soon backed away from involvement with her because I was quite content with very little and her lust for ‘things’ filled me with anxiety. She now has a huge ‘ranch’ with many horses, attends dressage events, (her daughter competes where she failed to), in a souped up giant motor home with amenities the rich and famous would envy. She has a second home in Hawaii and a shop for western wear that is cram packed with all manner of dead animal things, Swarovski crystal embedded handbags and authentic Indian jewelry she touts as “having great weight”; the bigger the better I guess. Seeing all of that eventually gave me the same anxiety it did when we were roommates. So, full circle, I’m up again this morning tackling some wonderful things. It’s so hot in the mid-afternoon now that I am finding inside jobs to do. I have lots of second hand furniture that almost all need some kind of amending. This is how I get my “Designer” on now. Years and years of accumulating ‘junk’ here and there is being transformed into a space I love. As a designer, I was privy to left over materials and have quite a stash of great drapery and upholstery weight fabrics to play with. It’s now a matter of what to use for what. This was a huge piece of a highly sought after, (at that time), Waverly pattern. Over 20 years ago, I cut off pieces of it to make little curtains for my mother’s laundry room. I’ve always loved it, but couldn’t quite find the right place for it. It’s cotton, so even after all of these years it is in excellent condition. There is enough to make two side panels for the big window in the living room. I’ve committed to using it as a jumping off point for what I put on or do to other things. This is a chair I inherited from my sister. It is in horrendous shape because I tried to paint the fabric and frame and the cane sides have gotten punctured. It is really comfortable and guests seem to prefer it. Until I can make myself learn upholstery and re-caning, this fabric table round makes it tolerable. Another thing from my sister. The floors are all getting a mosaic tile treatment. I ran an ad in our local trader not long ago and got quite a big stash for free from just two contributors. I just brought some in and laid them on the bedroom floor to start washing and deciding how and where I want to lay them. Years ago, when ‘head vases’ were all the rage, I certainly couldn’t afford them, but found a love of these animal vases instead that were just a few dollars each. For years they lived in boxes. Periodically being influenced by the minimalist mentality I would think, “I ‘should’ get rid of them”. I’m so glad I resisted. After donating 2/3 of my books to the library awhile ago, I got the vases all out and put them on the highest shelf that I look directly at when lying on my bed. They make me so very happy. Little things, mean a lot, and… I built the shelves myself, (using closet brackets, planks and included poles), which adds to the satisfaction. I use the poles all of the time to sort clothes while doing laundry and for displaying things I’m working on up-cycling. Okay, so this isn’t actually using the pole, but I do, I can assure you. There is a collection of things I made (or am making) hanging here and sometimes they are strung out on the pole to inspect. Here they don’t take up so much visual energy but are still available to remind me I’m not finished with them. Over winter, when it was the opposite of now and too cold to be outside in the garden, I brought fabrics in to work on up-cycling projects. They are just being sorted to take back out to the studio; which is a ‘next’ project to get sorted and set up to use during these too-hot-to-be-outside days of Summer. Everything for sewing has finally made its way out there. It just needs to be tweaked into better organization for actually using. I have a few nice things that need no help from me. Years ago now, when I opened a window coverings business here in town, I splurged on this mirror chest to act as a centerpiece in my tiny little shop. I just simply love it. The electrified hurricane lamp sat on my mother’s nightstand for years. I was the beneficiary. These kinds of things I just can’t part with. I remember many days of sitting in her room with her and seeing it. The green triangle bowl she bought from a thrift store. One day we were ‘mooching’ through and I was fondling it, too poor to purchase it. Sometime later, I was delivered her conventional brown paper bag with a ‘tear dryer’ in it. It was this bowl. She gave us things when she thought we needed cheering up. This beautiful work of art was purchased just as it is in a second hand shop. I ‘needed’ it. It has all the colors and sensibility of things I like. The dangling bookmark was my sisters. Some verse of wisdom was written on the back but has now rubbed off. The cheap utility clamp light, $6.97 at Walmart, is perfect to read by. It reflects the light on the ceiling and broadcasts it softly all over the room. The headboard, of which there are a queen and full, (the full is in the guestroom), were donated by a client of mine when we were setting up a home for my dear departed sissy. Now it has come back to me. It could easily be padded and upholstered. I thought about getting rid of this old set of The Books of Knowledge. My father was a pushover for door to door salesmen. We got these instead of the Encyclopedia Britannica. Many reports were written from these. Before parting with them, I sat on the edge of my bed with a random one and it opened to this page. The information is timeless and not often made as easily understood as this, so these books are staying. So much for a minimalist lifestyle. So much abundance, sometimes I feel like it is too much. I’m just grateful that most of it is old, pre-owned, inherited and still of great usefulness. There are projects at every turn. Again, my mother bought each of her three girls and herself too, this print; all of them second hand. The frame and glass have broken, I still have the pieces of the frame. It’s on the to-do list. Meanwhile the laundry basket, making its way to where it is supposed to be, supports it where I now want to hang it, reminding me to get both things done. I dreamed about my old roommate last night. I guess that is how we process thoughts and get them sorted. I woke up feeling not one bit envious of her exorbitant lifestyle. Au contraire. I felt revitalized, convicted for having had such lusting thoughts and renewed in my confirmation to live as radically simple a life as I can possibly accomplish. And, happy as a lark about it. Because I don’t use air conditioning, but rather fans blowing on me when I sit or lie, I get to enjoy the sounds of silence and whatever warm or cool breeze might flow through the open doors and windows; fresh air anyway and sweating just helps process toxins, right? I hear bird song most of the day. People refer to me as “the lady with curtains hanging on her porch like they do in Bisbee”. The curtains help keep out the morning sun from the East in the Summer, give me privacy from my neighbor all times, and help keep the cold out during Winter. The folding shutter is out there to make an enclosure for the kitties. That will be on one side for privacy from my neighbor and the other will have a chicken wire door for a catio of sorts. Projects at every corner. If I had no end of money, I could hire someone else to do it, but then what would get me up in the morning? Standing on the mudroom stoop. Soil is defined as that portion of the earth’s surface in which it is possible for plants to grow. It is the storehouse containing the chemicals which men and animals need to build their bodies. We do not get these chemicals directly from the soil. Plants draw them from the soil and change them into food that we can use. We eat the plants, or animals eat them and we eat the animals. If the soil lacks the necessary chemicals, the plants that grow in it are partly or wholly unfit as food for man. Soil is made up of mineral and organic matter. The mineral part is rock that has been broken down and chemically altered by a process called weathering. The organic part is composed of decayed plants and micro-organisms (very small forms of life). Most soils are made up largely of mineral matter, but there are exceptions. Muck has about 50 per cent organic matter; and peat has more than 70 per cent organic matter. So, muck is a good thing. It’s all about perspective. I’m glad to have had my perspective challenged and brought full circle back to being wholly satisfied with #VoluntaryRadicalSimplicity as my chosen style of life. The main reason water is disappearing from the rivers is that rain has stopped falling. The first step we must take in countering desertification is not to redirect the flow of rivers, but to cause rain to fall again. This involves revegetation. What I have quickly discovered after removing straw and wood chips from my planting areas and instead, planting green cover crops is that the interspersed food crops are fairing better than they did last year with the carbon type covers. I think it is because of the humidity that the green cover crops create when they transpire, thereby cooling the area some as well. As it is, in a desert, for carbon covers to be of value they have to be irrigated regularly to break down and they don’t seem all that efficient at holding much moisture; especially not straw. I decided to invest that same water in green covers that will be chopped and dropped eventually. It makes more sense, to me. Both clover and buckwheat flower. Bees love the clover. Turns out there is a honey that tastes like molasses that depends on buckwheat for the bees. Win-win. Here is something I would do if I could. Bees in a field of buckwheat seems too good to be true. The source of my all-time favorite honey, Fagopyrum esculentum, just doesn’t want to grow in my shady forest apiary. Believe me, I’ve tried. So I have to be content looking at a photo like this and dreaming about the molasses taste of buckwheat honey. I’m also throwing out old seeds willy-nilly. Why not? Whatever should come up, can be more biomass or food if it ends up fairing well enough. Here are a couple of stands of buckwheat that are doing especially well. They seem to like being up against something. Behind the pomegranate tree, the straw was pulled away and buckwheat scattered. The intention is to improve soil. The straw there did very little to improve the soil. This will be chopped and dropped closer to monsoon season when the rain will help it decompose more consistently. The #WestMost corner of the #SouthForty Triangle lot was ‘clawed’ up and buckwheat broadcast. The dirt in all areas of this compound is sandy. It is hard until watered well and then the water dissipates quickly. When developing this corner, it was watered heavily so it could be dug up to remove Bermuda grass. Nothing has been successful with Bermuda grass except to do this at the beginning. I suppose if lasagna beds were made, in due time, it would smother the grass; but there just weren’t resources for that. After the Bermuda grass was removed, the dirt was leveled out and newspaper/cardboard/straw was laid over it. It had very little effect in a year’s time except that the newspaper and cardboard were broken down. That is now being use in the Humanure bin. All of the straw was raked off and put into the paths this year and then I got out the ‘garden claw‘ and broke up the dirt enough that buckwheat could be broadcast and raked over to set it. I’m so glad I decided to do this. I’m much happier with the results over carbon covers. The other thing one might be afraid of is competition, but my experience thus far has been that everyone likes being crowded. Below is an image of what looks like a watermelon that has volunteered. To the left is a cage over a pumpkin that was transplanted from the patch on the down side of the #4HugelBed. It’s as lush as can be. Looks like a volunteer watermelon in there among the buckwheat and zinnias. The #PumpkinPatch has a fourth one sprouting. Two others were transplanted. I have been using the raked off wood chips and some leaf mulch to cover transplants and seedlings where they are too exposed. As a result, volunteers are popping up all over from seeds that didn’t germinate in the areas that material came from. I always pulled back the covers to sow seeds, but the birds kick it back over; so when it got raked up, it brought seeds with it. Whatever works to get things started. Where the wood chips were laid, volunteers are popping up around the tomato transplants; beets and looks like radishes. Bunching onions covered with a little bit of leaf mulch. Where I sowed bunching onions was covered with a little bit of leaf mulch that also brought over some things to surprise sprout. The #5HugelBed was just installed at the beginning of this season. Clover was immediately broadcast over it and later filled in some with buckwheat. I think it’s two cantaloupes growing there, not doing all that well, as well as a yellow squash and a nasturtium. Wood chips were added around them to help retain moisture some. The #NorthFencePlot is home to many of the tomato transplants that are all doing well. This was thick with wood chips and several times sowed with beet seeds; pulling back the mulch to put in the seeds. Again the birds kicked it back over hunting for grubs and other bugs. It was mostly raked off so some of those seeds are popping up where the wood chips ended up. Now there are some zinnias finally appearing along the fence where they were scratched into the improved soil minus the wood chips. The bricks were holding down the wire trashcans when the tomatoes were babies and needed some shelter; just haven’t bothered to move them. The #RaisedBed still has some cabbages doing okay. The chicken wire has done little to thwart the white butterflies as they can navigate the wire easily. I see them in there all of the time. Some are more affected by chomping than others. Popcorn rows between and aside the cabbages and some sweet potato slips put in the upper right area where leaf mulch was topped over the soil. The lower right had some cold-compost put over it and all kinds of things are volunteering there. Some will get transplanted when they get big enough. Seems to be taking forever, but in time, it will become greener and greener; this season and hopefully long term as well. I find myself almost jealous when I visit images of Bealtaine Cottage and see how lush and vibrant her patch of heaven is; but, after all, she is in Ireland where there is so much more rain. I wait with bated breath, but nature does things as she sees fit. All in due time. I can only try to help. Water seems to be everything. Well I for one will listen to the wisdom of Masanobu Fukuoku and do my best to green this little part of the desert. Maybe the water will come back if enough of us do. The time has come and gone to get started, so let’s not waste any more of it. Chaste tree in bloom. The bees love it. Some of this had to be resown, hence the various heights of the popcorn. Not all of the squashes germinated but there are some extras on the #3SquashPit that will eventually be transplanted to here. I’m not a big fan of sweet corn, and it doesn’t store all that well. Popcorn I love and it can be ground into meal to use for baking cornbread and stored. I’m still reluctant to use external inputs because there is not really any telling if there is herbicide/pesticide residue that will contaminate the organic nature of what I hope to achieve, in the long run it isn’t really sustainable/regenerative and it isn’t what I am being lead to believe is the best way overall. Transportation and money are issues as well. For now, I work with what I have and can find locally and am trying to stick as much as possible to the Fukuoku method. We’ll see. We’ll see. All in due time. Writing a post here has been under-inspiring since it seems that all of the efforts to accomplish a food forest (of sorts) here in the Southeastern corner of Arizona, USA shows so little impact over the short term and therefore little to talk about. I have, however come to the solid conclusion that bringing in outside inputs is futile and a waste of money, aside from the wonderful leaves my neighbor contributed last fall; which, by the way were free save the exchange of tomatoes come harvest. Leaves seem to be the pièce de résistance; the resource of most importance. He had so much, and combined with what I had, it amounted to enough to spread some over things and corral the rest in a big bin to decompose. Overwinter, I utilized , liquid gold, (urine), to accelerate the decomposition of the leaves in the bin. By the time Spring rolled around, the bin leaves were a wonderful, nearly broken down mass of wonderful, dark, rich humus. The leaves atop of things were nowhere near as well decomposed. They did seem to add to the quality of the soil underneath them, but not to any great degree. The bin leaves were simply wonderful. I did not turn the leaves at all. They just sat there all Winter getting rained on, watered when I thought about it and urine was dumped over them from time to time. The bagged goods and straw have only been of value for pathways. There is just so little moisture in the air and it rains so infrequently, that it doesn’t have anything to hold into the soil or use to break itself down with before it crumbles into little else than dust that blows away. Wood chips don’t blow away as much as they simply DO NOT breakdown well. Fine for paths and possibly over things to help keep from having weeds. Straw I’m pretty sure brought in herbicides and I just read lately that it is a preferred habitat for slugs. …as well as the Will Bonsall‘s philosophy of “no external inputs” and growing your own compost. As a vegan, Will consumes no animal products. He enjoys fruits, vegetables, leafy greens, and whole grain products. His gardens are filled with a variety of crops. Animal manure is out of the question for Will as he feels that relying on cow manure is tying in with a system where farmers are raising crops to feed animals in a cycle which depletes the food that should be grown for human consumption. Only green manure is used at Khadigar Farm. Will also is in opposition to farmers focusing on growing their food primarily for markets. He feels that food should be grown for a self-sufficient lifestyle. Clover is wonderful. It can be tall or short. This is short, White Dutch clover being grown mainly to add to the value of a sitting area but it also is a flowering plant that the bees love. It requires regular irrigation, so not so wise in the desert. It does much better in less than direct Sun to even shade. It’s a nitrogen fixer, so I let it live among growing things as well. If you’ve never heard of a squash pit then you might be thinking “but squash have seeds, not pits!”. True, true, but check out this fun video. I have also decided that burying things is a better strategy than carbon-type mulches over things. So, instead of trying to make compost with all of the resources available, much of it gets buried in things like Hugelkultur or Squash Pits. The above pictured pit was planted with popcorn, (the first sown seeds only yielded one stalk, so it was resown), squash and some bean seeds that were in a jar I thought were from a friend. I think they were garbanzo beans from a bag I opened thinking I would cook and didn’t. They popped right up, so whatever works. It’s all biomass if nothing else. At this point, it’s all about growing/utilizing things that will add to building soil. I had to resow the squashes too. One came up with the first sowing, now the rest are starting to show. Hugelkultur are no-dig raised beds with a difference. They hold moisture, build fertility, maximize surface volume and are great spaces for growing fruit, vegetables and herbs. Hugelkultur, pronounced Hoo-gul-culture, means hill culture or hill mound. Last Spring lettuce was grown in the #NorthFencePlot to little avail. It grew well enough, but was all very bitter. It was left as biomass. A few were left to bolt for saving seeds. They are tiny and hard to harvest, so I just crumpled up the debris and rubbed it all over the #2NarrowRaisedBed. It’s popping up nicely for a green cover. This was originally filled with terrible bagged goods that nothing would grow in. Most of it was scooped out into the path; the finer stuff was left in. The newly growing green things will add to the continuing breakdown of the woody matter over time. Buckwheat is behaving just as it was described to do. It sprouts almost anywhere, grows very quickly and can stand the heat. It is being sown wherever there is a bare patch of ‘dirt’ for a green cover crop/chop and drop. It will self sow in some climates. We’ll wait and see if it will here. It has been broadcast twice now, so some is flowering already. Apparently, it didn’t get ‘hot’ as now things are sprouting/volunteering and I’m a gonna just let them have at it to see what comes of it. Again, more ground cover/biomass if nothing else. MickeyMouser and Lucy (Mini) in their #HighriseLoftApartment under a tree, doing the no-till (it’s time to eat), do nothing method. Chop and drop yellow, tall clover under the Apricot tree. So, Bob’s your uncle! That’s what the plan is now. Happy No-Till Gardening to you all. Easter with dresses made by mom. Me on the left. My handsome father and two sisters. I was a middle child. I wanted to be an interior decorator since it wasn’t going to be possible to become a fine artist, as far as I could tell. It turned out that decorating would be mostly about selling things. I wasn’t really any good at selling, unless I was passionate about what I was selling. The passion was in the design end of it, but that far from satisfied employers. The last comment came almost immediately after one of my clients had come in and sat right in front of me, with my fellow workers looking on, to rave about how happy they were with what I had done for them and just how much they really liked working with me. The trouble was, I couldn’t stand for someone who thought they knew better than me about what motivated me telling me how to do things. And that particular boss had all of the other salespeople by the nose, but couldn’t quite catch me and it infuriated her. Money was never the motivator. Freedom was. Freedom to create. It was the sheer act of creating that delivered me to a zone of utter euphoria. As a very young girl, I spent countless hours alone in the fields behind our house dragging things around to create virtual communities for my friends and family. It was all in my head, of course, because even then, “People didn’t like me”. I didn’t care much though. I liked me. I didn’t think so for a very long time because society forces one to think that if one doesn’t have countless friends, they don’t really matter. What I discovered eventually was that I truly enjoyed being in my own mind, and, for the most part, being with others, crippled that some. Turns out, I am an extreme introvert. I do love other people and enjoy them immensely; however, interaction exhausts me. I have to crawl back into isolation and recover. And creativity allows me to regain my life force before, during and after such interactions. Any kind of creativity. One of the first JOBS, (four letter word), that I truly enjoyed was as the Customer Service Manager of a well respected furniture store. I found my life-long BFF at that job, which only put the frosting on the cake. I took that job after I had a run in with the owner of the same store while I was trying my hand at selling. He didn’t like my performance with a customer he had been hawking me working with, (I knew he was watching and I am NOT a performer), and cornered me later to tell me how to do it better. I watched him pick up that same customer and send them out the door exasperated after having had him use every trick in the book to try to work them. So, to preempt what I thought would lead to eventual firing, I saw an opening and asked to be transferred. I really loved the customer service job. It was mostly paperwork, which I really didn’t like all that much, but it was also schmoozing vendors and customers, (selling just the same), but on a whole other level. And it was creating systems that allowed for the whole thing to run more smoothly and getting things in order, which I still love to do. Creating. That’s the key to my happiness. Any kind of creating. After years and years of running in the squirrel’s cage, I finally found a way to get off and out of the world that would rob your very soul. Now I am peacefully planting food and moving things around, creating things and putting things in order; just as I have always wanted to do. And it matters not one iota that I don’t have fancy schmancy things or the latest greatest. In fact, it is far more fulfilling to see what can be made of whatever is on hand. Every time an appliance fails, I try to figure out a way not to need it. The time and inclination to build a #SquashPit. No cost, resources rescued from garden centers wherever they might be found. #5HugelBed; nothing goes to waste. Supportive ‘friends’ along the way.. The joys of nature and purple. I hope you are doing what you love and having all the freedom you need to do your own creating, whatever that might be. So, I said the other day that I plan to only grow a few things; things I eat on a regular basis. I then sat down to compose a list of those things, and it grew and grew; 28 items so far. So much for keeping things simple. Some things aren’t so much of a ‘regular basis’, but are included in my repertoire or are things I want to eat. I don’t eat celery, per se, but have just learned that celery juice can aid digestion and might be of benefit to keeping migraines at bay; which I think to be an issue of low hydrochloric acid production that compromises breaking down and metabolizing nutrients in the stomach before reaching the intestines, (where I think the trouble begins for me). Purchasing organic celery in quantities large enough to juice is cost prohibitive, so it has been put on the ‘to grow’ list. Most of the focus this Winter has been on establishing ever more soil-building venues, which are taking myriad shapes and sizes; the main goal being to give the microbial life food to eat. The excerpt below from this article gives a good explanation of the process. With the soil structures established, beneficial microbes can thrive, and here’s what they can do for our plants. Bacteria and fungi “mine” the soil particles for minerals. Something that plants can’t do. What they can do, is to turn sunlight, water, and CO2 into sugars, and they use them as currency to exchange them for the minerals with the soil ecosystem. It works roughly like this: the plant makes the sugars, sends lots of them into the roots, and pushes them out into the soil. That sugar feeds bacteria and fungi, which in turn mine the soil for minerals. In most cases, they can’t simply give the minerals to the plant. What comes along, and eats them is the mechanism that releases the stored nutrient right beside the plant root, and what enables the plant to get them. One of the first major things done toward building with a permaculture strategy was this Hugelkultur bed. It was the first one and is still the largest. All of the years living here had accumulated major amounts of wood and debris that were saved for creating this. With so little rain here in this high desert, it takes more time for the wood inside to saturate and become sponge-like. The leaves are to benefit the top part of it. Keeping soil covered is essential. There are now numerous bins around with a variety of materials decomposing. Good success has occurred in years past by planting in these structures. The struggle has been accruing enough material for them. Mr. #GoodNeighbor doubled my inputs this year. I’m so grateful. This bin was created when I needed the biggest wire round available for the #HumanureBin and robbed it from the composting kitchen scraps. They were all put in here along with cardboard, paper, leaves, dog hair (from trimming Little Red-Haired Girl)…etc. In the back yard now are two wire rounds with stuff that accumulated while I was moving dirt around; Bermuda grass, weeds, leaves and a little dirt in between layers. I call it dirt at this point because it is primarily just bacteria with little microbial activity. The organic matter will feed that activity and eventually these will be good planting beds or compost to use elsewhere. And, of course, there are all kinds of little beds and builds that have a variety of materials decomposing and layering for future planting. Except for pathways, all areas are getting treatments, slowly but surely as matter accumulates. In the meantime, cover crops are being utilized as well. Not too long ago, it was revealed to me that radishes make a good cover crop as their roots are long and tap the soil, doing the cultivation that supports the no-dig permaculture philosophy of building a food forest. If left in, the roots are food for the microbiome. I’m not much one for radishes, but I do like to eat the seed pods raw; they are much milder and a good foraging crop while out working in Spring. Fruits weren’t mentioned In Alphabetical Order columns above. Those were mostly annual crops. So far there are two apple, an apricot, a plum, pomegranate, and fig tree growing somewhere on #TheCompound. One blueberry bush in a container in the front yard as well. Growing food in a desert requires that every possible method of collecting and holding water be utilized. The best way, of course is for it to be saturated in a saving way into the ground where the plants can extract it as they need it. That’s where Hugelkultur is so valuable. There are four mounds now in various places as well as two areas where sticks and arbor debris was just buried; not making a mound. Also a couple areas where sticks and leaves are just piled on the surface. The whole purpose of everything that is being done is so that no digging will then be required going forward, therefore allowing the microbiome freedom to do its thing without interruption. This Winter has been a good one for rain so far as well as mild temps. This will benefit the strategies in place and is allowing cool season crops to progress without the trauma of more serious freezes. I’m hoping that some of the brassicas planted at the beginning of Fall will make it through Winter and be mature enough to harvest something before bolting and going to seed. Another thing I’ve been experimenting with is tossing seeds of all kinds when they show up; like when the chaff from culling seeds from brassicas were spread atop several beds. Invariable, there were still seed pods on them. Some volunteered in the #1NarrowRaisedBed. They were thinned out today and brought in to see if the ‘kiddies’ might be interested. They like the smell of anything that comes from the yard. Sure enough, Lucy jumped right up and started chomping on them and then Mickey followed; he’s a copycat. The point of throwing things willy nilly is to see where they might like to grow. It’s interesting to watch what happens. I’ve had no luck with getting cilantro to grow without bolting right away; but some thrown over the fence into the #ParkwayProject are going along nicely currently. I admire people who map and plan and set things up systematically. I can’t bring myself to do that. If it isn’t fun, you won’t stick with it and planning too much just isn’t fun to me. So, I’ll get what I get. Whatever makes you grow food is always a good thing. The only thing you might need to do is add organic matter and water. Nature does the rest. Don’t dig. Feed the microbes and leave them be. We’re at the end of 2016 now and it’s the day for ringing in 2017. It’s a good day for summing up a year’s worth of efforts to build a “Simple Life of Abundance and Peace”. I’m ever grateful for the freedom to pursue this dream I’ve long held; having basic needs met and time to do things the way I’ve always wanted to. It might be fun to have no end of money and be able to ‘buy’ all the things that could accomplish the ultimate goals more quickly; but I think, the best part of it all is the journey and the challenges that near-poverty offers. I’m rich as far as I can tell. Of course, a big part of the dream is to have the ability to walk out into the property around my home and be able to pluck the foods to eat each day. Living in a high desert, there are many challenges toward that goal. A big part of what was done this year was to create as many soil building strategies that resources available to me would allow. Having a #GoodNeighbor offered external inputs that were unexpected and allowed to increase this goal more quickly. Another goal is to not need external inputs, but that is a very, very big challenge indeed. My #GoodNeighbor gifted so many leaves that I was able to completely cover the #1HugelkulturBed and make this big bin. For some reason, most of his leaves fell before mine did, so once mine fell, I had enough to cover the #RaisedBed and the #NorthFencePlot, all of which are in the #NorthFacingFrontYard. The #ScragglyTreeBed got a layer as well because, after all, it’s right under the main leaf dropper. My #GoodNeighbor also dropped a huge load of oleander debris from a job he did nearby. He said it would be a lot. I had no idea it was to be so much. I distributed it all along the #AlleywayProject. It ended up being about 12″ thick before it started its breakdown. I think once the leaves dry and drop, I may re-corral the sticks for another purpose. Green, they are easy enough to lop, but once dry, too hard; and there are just too many of them to lop at this stage anyway. I did lop them down enough to get them laid here, but that was enough. So much was accomplished this year. As I look back at images, I realize just how hard I work to not work, (a ‘real’ job). This is exactly the kind of work I’ve always wanted to do, just providing for myself the best I can. 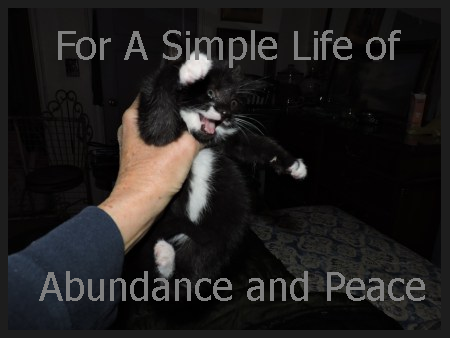 Part of the “Simple Life of Abundance and Peace” requires that radically simple solutions to things be the modus operandi. As appliances are wearing out and beyond repair, they are being replaced with simpler ways of doing things. This usually means harder and taking longer. A big part of simplicity is to do things in ways that create far less of an impact on the environment, waste far less of precious resources and contribute more to bettering community. Plumbing issues have been with me from the beginning of taking this 1945 built property. They have been being addressed defensively as money just isn’t available ahead of most issues. This faucet has been a nuisance for a very long time. Things have been under it and beside it to collect drips for several years probably. The metal is so calcified, I’ve been afraid to try to tackle it myself. The #SouthFacingBackYard has been in terrible shape for a long while and has been grating on my nerves to improve it. Once #TheCatastrophe was fixed (new window glass silicon secured into the old frames), work began on the back yard. There was a mess of things up against this window while I waited for the $$$ to put the new glass in. There was a gorilla rack behind two glass doors, timely donated, to keep weather from overtaking the plastic taped to the window frames. The gorilla rack was relocated under the tree to the right of this window for the kitties #HighriseLoftApartment to sit atop. But, before that could be moved, all kinds of junk had to be moved out and the dirt leveled. Years ago I created an elevated area to plant a peach tree. The peach tree failed and for the life of me, I can’t remember the thinking behind moving all that dirt. Nonetheless, it had to all be moved again. During the dirt moving, leaves were raked, weeds were pulled, Bermuda grass dug out and a bin created to hold it all. The working faucet was farther away, so I turned the calcified one on and that was when the plumbing trouble began, this time. Once the calcification was broken… drip, drip, drip only this time, much faster and more of it. So, out to the main to turn it off. Then to try to assess the trouble. Dig, dig, dig. The pipes were finally exposed and identified. The plumber was grateful and said it would have cost me another hour of his time had I not done that. So, while the water was turned off and I’ve been waiting for the plumber to find time in his busy Handy Andy schedule, toilet flushing became an issue and it was decided to be the perfect time to start composting my own ‘waste’, rather resource; #Humanure. Remember that no external inputs goal? Well, there we go, further along the road less traveled; resources from within. And, thanks in large part to my #GoodNeighbor, I had lots and lots of leaves to use to get things started. An album was created on the First Do No Harm Front Yard Farmacy Facebook page, here for how the bin was built. I researched it and of course have the book, The Humanure Handbook. Here is a great page with all the how-tos, why-fors and what-nots directly from the author of the book if you want a short cut. Be sure to click on the links therein. Great stuff. And here is a wonderful essay on rural hygiene, written in the latter 1800’s, digitized and made into a pdf. Fascinating stuff and to realize that composting humanure was the answer at that time to the trouble that was a cesspool. Mr. Good For Trade, of course, came along and over took any useful enterprise to capitalize on those same needs for profit in spite of what it might do to the betterment of community or the environment. Not much changes with time, unfortunately. Before the faucet trouble, there was the demise of the washing machine; one that was my mother’s, pre-owned when she bought it inherited when she died, then used by me since 1997. It had a good long life. It was at least 30 years old. I have been hand-washing clothes ever since and it does present some interesting challenges. I’m trying to will an old fashioned ‘hand wringer’ to myself to make things a little easier. Another of the goals started this year was the #MosaicFloorProject. I had been collecting tiles here and there. At one time, I was bringing home one or two at a time to see what I might like to install throughout the house. Once it became clear that that would not likely ever be in the budget, the mosaic idea came to the front. This has been a goal since I moved in here 13 years ago now. Finally. I got this far when I realized I should put an ad in our local trader to see if I could get enough to do the entire house. I stopped at this point to wait to see what came my way so that they could all be worked together for the greater look. Two people responded to my ad. This was one collection and another came later. Originally those same tiles were stacked in the carport, but with all of the defunct appliances accumulating, I needed this area to stage them for getting them off premises. So, the tiles were moved to the front of the house. A lot has been done this past year. These are just a few of the more recent things. As the year comes to a close, it’s fun to think about what’s ahead. We’ve been having what seem to be more rain than I can recall from past Winters. So wonderful. And it all started right after the leaves had fallen and needed it to weigh them down and get their decomposition started. That makes me so happy, because it means that the things put into place for soil building will likely be further along than they might have without it. All throughout the year, I’ve been doing things to practice food forest concepts. In a forest, things just land where they do and nature takes over. Some cilantro debris was tossed over the fence from some that had grown, turned to seeds and got wet over Summer. It volunteered and is growing as we speak, right next to one of the three baby Italian Cypresses that were planted equidistant apart in the #ParkwayProject. Likely while carrying seed heads around, a Brassica volunteered at the West end of the #RaisedBed that had Sweet Potatoes last year, 2015-16; see header image on the main page. There was arbor mulch buried here that same year after building a little #2HugelBed right before it; so there is composting material under the surface here. Today I spotted this critter in the #HackberryTree in the #SouthFortyTriangleLot. It looked just like a cardinal to me, though a little trimmer and black. Sure enough, there is a bird often referred to as a Black Cardinal. I take it as a sign of unusual and wonderful things to come. Apparently it is only ever seen in the Southwest. Lucky me. It’s the first time I’ve ever seen it. I see cardinals all the time and they are a treat as well. Part of the value of living this kind of lifestyle is that it makes one feel less vulnerable to the “powers that be”. So many ugly things seemed to have happened this past year and it doesn’t seem to be relenting. My hope is that enough of us will adopt this kind of lifestyle to make a difference. If ‘they’ don’t own us by our need for sustenance, they really can’t manipulate us the way that they have. At least that’s how I see it. For now, I’m happy that my Little Red-Haired Girl is still with me. She got very feeble this year but she is a trooper and I feel that it isn’t my right to decide when she should go, it is hers. She’s my joy and I will love her just the way she is and do everything in my power to make her life as good as it can be. I pile her up in dog bedding right next to me. Middle of the night she wants out for a pee and then she spends some time on her mat on the floor. Sometimes I lay her on my chest and we sleep like that for awhile. If she’s having a bad night, it seems to calm her to be on me; she relaxes and falls right to sleep. I love her to the moon and back. She’s a hot mess, but I do as little intervention as I can so as not to traumatize her. Mickey and Mini (Lucy) are never far apart. Mickey has gotten to be quite a large feller. Lucy is a very little kitty; she’s 2, he’s 1. Gertie is in pretty good shape. She can’t hear worth a darned. If I call her, she goes opposite of my voice, even if I whistle. So, when we’re out together, she keeps a close eye on me. It’s a food thing. I usually have to go up and tap her if I want her to come in. All in all, it was a very productive year for me. Still not providing my own food to eat, but have great hope for the future. I’ve decided that I’m not going to try to grow a bunch of exotic things or too many things in general; but rather just focus on the things I eat regularly. I do have two avocado trees that volunteered from seeds in compost that I have been babying along for two seasons now. They will need a greenhouse to keep going. That is a goal; a poly-tunnel at the least. I found a bean that grows well in this area and will practice with it next Monsoon season, during which time they are supposed to be planted. Tepary Beans, grown in this area with great success, actually won’t grow right if they get too much water. Aren’t plants just the most amazing things. Mostly what I eat is beans, rice, sweet potatoes, potatoes, Brussels sprouts, onions, garlic, tomatoes and avocados. Of course there are other spices like turmeric I’d love to figure out how to grow and herbs like Chamomile. I do need to think about greens, but they too are a rather tricky thing here. Since Brussels sprouts are so, so good for us and a favorite of mine, I am determined to figure out how to grow them. The staples are what I will focus on for now. It would be nice to be able to grow a grain. My #GoodNeighbor was talking about how he’d like to grow wheat. Imagine if each neighborhood set up a string of growing venues to help each other out. I believe that and I’m going to spend my energy trying to will that for the world this coming year. The only other ‘resolution’ I may project is to quit buying Payday candy bars to torment myself about eating processed sugar with. Those and Cheez-Its are a struggle to pass up at the grocery. The thing that helps to keep me from purchasing them is that they site *Palm oil as a possible ingredient. That and the ‘real cheese’ are enough to make me stop that unsustainable, foolish, unfriendly thing. Hole forests are being razed to grow palm oil trees. How can I possibly be complicit with that not to mention the horror that is a dairy! Time to start planning for Spring, because it’s closer than we think! My mother raised three girls all by herself. Even when our father was a small part of our lives, he was a chronic alcoholic military man who was seldom home and when he was, he was not available; that’s being kind. She did a wonderful job, sacrificing everything for us. She worked at the military base, about 5 miles from our house. The three of us were about a year and a half apart in ages, give or take. I was in the middle. We lived in this little “cracker box house”, (our mother called it) from the time I was about 5 until I was 13 and then we moved up to a much larger, ‘farmhouse’ on the main street where people of better means owned homes. We rented. There was a lot of land around it that had been a farm and most of it had long been sold off, but we just rented the house. It had been vacant for years, but somehow it became available and our mother lived in it until the day she died, about 30 years. She loved it; it was her American dream come true. Whenever I go through California, I always make sure to visit certain old stomping grounds and home. This image was from a trip I made about 5 years ago. The house used to be white with yellow trim. We thought we had moved into a mansion. It was so much bigger than our little cracker box and had so many more amenities; forced air heating, a basement, two big bedrooms, lot and lots of cupboards and closets, a laundry room, breakfast nook, a real dining room, and a detached two car garage. It came furnished with antiques. It had a fireplace too, but our mother would never use it. When I finally was able to buy my own home, it was a two-story with a fireplace, which was definitely used. The thinking of the time was to buy as big as one could afford. It really did feel like living in a mansion, especially rambling around mostly by myself. It had 4 bedrooms, a family room, living room, 2 1/2 baths and plenty of planting opportunities. I started immediately, tearing things apart. The big ball in the middle of the front yard was a massive olive tree that had been groomed with pom poms that were completely unmanageable, so I cut it down to a stump and let it grow out until it could be groomed into this ball. Working at Home Depot at the time, originally as their “Design Homer” (store-wide decorating consultant for customers) and eventually in the hardware and garden departments (when I finally got fed up enough with the abuses), every extra dollar was spent on plants and tools so that I could become as independent as possible. The neighbor behind the ball and to the left was an extended family who had every available piece of their property, including the sloped parkway you can see, planted in food bearing things. I was in awe and wanted to someday accomplish the same. It was my first encounter with permaculture/food forest thinking. The other three neighbors, the one directly in front of me and the ones on either side of me were unfriendly to all of my endeavors. This was a little bit of an upper-crusty area and they all seemed to think that they lived in Beverly Hills. They were inclined to call the City to complain whenever I had garden amendments sitting in the driveway longer than they wanted them to be. When I went back that same time I visited my mother’s house, the new owners had taken out everything tall, green and long-lived and put in sod; including an avocado tree, a giant fig tree, many many drought tolerant shrubs, 20 year old tall, tall wax leaf privet shrubs lining the biggest part of three sides, a beautiful Jacaranda tree and so on. They tried to groom the stump back into pom poms. I guess what they all wanted was to be able to have the local ‘landscaper’ come do all their homes on the same day and for it to just be blowing and mowing. That house set me free, in more ways than one. It was a great investment. I managed to live there for six years, 3 of which were unemployed. It freed me in my thinking and gave me a platform from which to launch my entrepreneurial tendencies. I was clever enough to get out just far enough ahead of the bubble bursting, but a little sooner than I might should have; but you do what you have to do. That house was The American Dream realized for me, but I had to leave it. It’s very hard to know what is to come with the changing of the guards of this once thought of as great, America. I have an optimistic attitude in spite of a worrying nature; I can always, always see a light at the end of the tunnel. I think it is the worrying nature that bodes well for that as it forces me to analyze continually and in so doing, I really am forming a bigger picture and not a narrow perspective. There is always hope in a bigger picture. That’s not to say that the worrying doesn’t take its tole on my body and soul. But thanks to Gavin and Stacey and Elf the movie I can escape into oblivion every once in awhile. And, kind of like Goldilocks, I’m finally where everything is “just right”; a house that is a good size for me and my fur family, enough land around it to plant food, neighbors who support my endeavors, a City that doesn’t complain and even lets me work from my home doing sewing for the community, and amenities close enough to walk to. Even with the challenges of home ownership, it’s all worth it. Lately, I’ve had to finally resolve a long standing plumbing issue and it’s all unfolding nicely, just like things always do. It has made me realize more of what it means to practice #VoluntaryRadicalSimplicity, thinking more wisely about water and waste processing, how important human relationships are and the value of living in the moment. The City workers were great to help me and recommended the young man who will be solving my plumbing troubles. Nickels, dimes and quarters saving the day again. I make a habit of not spending change, but rather putting it away for a ‘rainy day’. It has saved me many a time. This time it turns out to be almost exactly what I need to get this plumbing job taken care of. Intelligent design. This ‘trouble’ has also made me remember that I have a great deal more sway over how my life turns out than sometimes I believe I do. Several years ago when I was still trying to create income, I returned to my training as a decorator/designer and placed an ad to work on Craigslist. It resulted in doing work for a wonderful lady whom I referred to later as The Star Client in a post I wrote about the experience. When this plumbing trouble arrived, I realized that I still have that to depend on and that nothing is ever as gloomy as it appears. I placed the ad again. Being a worrier by nature, but also having an optimistic bent, I am listening to everything about these new changes in our world with renewed intensity and am going to choose to believe that as bad as it seems, we really do have a lot more control over things than we might think and it can end up having a beneficial effect. One thing is for sure, I think it has caused a huge ripple that is forcing more of us to wake up and we are definitely talking about things in a more meaningful way. If you haven’t seen Gavin and Stacey, I recommend you check out the series from the library and watch it from the start. It’s hilarious and all about people finding a way to get along, in spite of, or even because of, all of their very obvious differences. You may think you need captions at first. It seems that they are speaking a foreign language. You’ll get in the hang of it if you stick with it. I am aware that “Cleanliness is next to Godliness”, but there are so many more interesting things to do. I got that from my mother, who also, was not much interested in having an ideal home, but rather loved her independent activities of choice. This is not her home. We were visiting a friend of hers, sometime in the 80’s. That was me on the far right. My older sister and I had no children; our younger sister went on to have four. The oldest of hers on the left, ‘grew up’ with us. Before my mother died, she had me pulling weeds in her little patch of vegetables. I didn’t have a home of my own, so I would play in the dirt around her home whenever I was there; which was often. Once upon a time I brought her a gallon sized container of ‘Red Apple’; which over the years, spread all over her yard and eventually was pinched and planted to create a screen of sorts around her front porch, growing up wire fencing attached to the vertical supports. My first tiny apartment had a terrace full of potted things, which I watered with a hose attached to the kitchen sink; mostly succulents. That was California, where succulents can live outdoors most of the year. Not so, here in Arizona. I have to bring mine in and out of the garage during the winter or they turn to mush. So my Home Sweet Home is now allowing me the opportunity to engage in independent activities of choice, like my mother did. And those activities have now been defined to be gardening, sewing, animals and health related activities. I do care about the appearance of my home, but it is a slow process getting it to where I want it to be; mostly because I have chosen to have more free time than money, per se. These tiles were free to me from a man who saw an ad I placed in our local trader. Now the fun begins. This last week was spent ‘redesigning’ the back yard some. When I first moved here, I did some things there that make little sense to me now; moving dirt around. Dirt is being moved around again to level things out for more planting opportunities. After clearing out the ‘messes’ and shifting the dirt. More shifting yet to be done. Sunday my neighbor brought over all of the leaves he raked from his yard. This same neighbor continues to bring me resources as he gets them. He apparently does work for others. He’s the same one who brought the oleander debris that you can see in the last post. He and his girlfriend are very fond of my tomatoes, ;). #MyNeighbor used my huge City trashcan to deliver the first load and it all went on the #1HugelkulturBed. The next several batches went to fill up two wire rounds that were positioned at the shady side of the #RaisedBed; performing double duty as a partial cover for the bed over Winter and as planting mediums come Spring. Not much is going on that is visible to the eye. A few brassicas are trying valiantly to grow, but mostly there is soil building going on. Winter is a good time for this and the strategies also yield habitats for overwintering critters as well. Next fall I shall plant more radishes and beets as they seem to be able to brave the relative cold here in Arizona, at least for a time; and that time helps to send their substantial roots down for breaking up compacted soil also helping to build the microbiome. Spring is closer than we think. It won’t be long before it will be time to start some seeds indoors. People often comment that something about my Home Sweet Home makes them think of Alice in Wonderland. I think it’s the colors that I favor; but there are other things, like this rabbit and a big collection of teapots and cups and saucer that I have accrued over the years. Whatever makes your home yours, I hope you have a wonderful holiday season and that you are engaging in independent activities of choice. It took me a long time to find my way to here where I am able to do just that. I’m so happy that the time has come. Morale of the story: There’s no place like home sweet home for the holidays. As much out of necessity as choice, Voluntary Radical Simplicity continues progressing at First Do No Harm Front Yard Farmacy. Our local Safeway sells my favorite bread, Food For Life’s Ezekiel Sesame for, regular price $5.99; $5.49 with club card. If one has the wherewithal to drive 50 miles to Tucson, it can be found at Trader Joes for $3.69 a loaf, fresh, unfrozen, every day. We all complain of Safeway’s local gouging. I don’t have the wherewithal, nor desire, but I do have a friend who is pretending to be a vagabond while he decides where he next wants to plant himself. Sometimes it is convenient for me to ‘order’ it from him as he travels there and back; two people not driving the same distance separately is a way to conserve energy, not to mention money. Voluntary simplicity, or simple living, is a way of life that rejects the high-consumption, materialistic lifestyles of consumer cultures and affirms what is often just called ‘the simple life’ or ‘downshifting.’ The rejection of consumerism arises from the recognition that ordinary Western-style consumption habits are degrading the planet; that lives of high consumption are unethical in a world of great human need; and that the meaning of life does not and cannot consist in the consumption or accumulation of material things. Extravagance and acquisitiveness are accordingly considered an unfortunate waste of life, certainly not deserving of the social status and admiration they seem to attract today. The affirmation of simplicity arises from the recognition that very little is needed to live well – that abundance is a state of mind, not a quantity of consumer products or attainable through them. I’m very happy that my life is unfolding this way. Amazon, about the above mentioned book: Humans have no motivation stronger than survival, yet the culture that dominates “the culture we call Industrial Civilization” has created a set of priorities that value financial wealth, the possession of superfluous goods and short, cheap thrills, above that most basic need. In short, we are prepared to die in order to live a life that is killing us. Time’s Up! is all about changing this. It describes what our actions are doing to the very things on Earth that we depend on for survival, at scales that we rarely contemplate. It arms us with the tools to free us from the culture that has blinded us for centuries, and which will allow us to live lives that will give the Earth, and ourselves, a future. This call-to-action proposes something radical, fundamental, frightening, longterm, exhilarating, and absolutely necessary—something totally uncivilized. Looks like a good book. This is the view I get over the fence in the #SouthFortyTriangleLot. Because of the school, it will likely remain virtually unobstructed. I don’t live in a mud hut. I am far, far from living quite as radically simple as I might should and may yet and I didn’t get to where I am without participating in the above mentioned Industrial Civilization. I think my soul has all along been calling me to simplicity though; because, as is a constant refrain here, I was miserable in it. Miserable, miserable living within the confines of Consumerville. I worked my career in the high-end home furnishings/window coverings industry. I served mostly rather wealthy folks who could afford the things being sold. I have been in hundreds of homes, most of them huge with two people rattling around in them. “Investments”. I remember going into a 10,000 square foot home and wondering why! Why would anyone want all of that complexity, expense and responsibility. There was a segment of our city (Southern California) that was devoted to McMansions. Everyone there was trying to out do the other with extravagances; tennis courts, etc. Many lovely people though and it certainly provided a living for me. I soon realized that I didn’t want the things society said I did; I wanted personal freedom to pursue the things I really loved. So, here I am in Arizona trying to grow food and live as radically simple as I’m able. My washer went kaput not long ago so I’m rigging up a hand-washing system. I still need a wringer before I can manage things as well as I need to; I’m on the hunt. I guess a new washer can be had for under $300, but it requires electricity and off-the-grid living is a goal here. My refrigerator did as well, so I purchased one of those little tiny ones for things that have to be kept cold and am trying to utilize other strategies for keeping other food; such as, purchasing daily-ish and trying to grow things I can harvest as needed. The most important endeavor for this lifestyle is to figure out how to grow food in a desert. The only thing above that is keeping my Little Red-Haired Girl happy until she decides to leave me. Little Red-Haired Girl with her handmade ‘hoister-upper’ on. The belt around her breast is to help take weight off when she squats to pee. I also help her walk around a little easier by walking with her holding up on the belt. The orange around her middle is how I lift her up from laying. It works perfectly. I slip my fingers under each set of silk-tie bows and lift her straight up until she gets a footing. It was made from a T-shirt, cut into two rectangles, a piece of flannel drapery lining between, quilted diagonally and the four silk tie ends stitched from the bottom up on each end and tied around her. Orange helps me see her when she struts out on her own. Living simply involves cooperation with others. My neighbor is happy that I am growing food and is offering trimmings from his own yard and jobs he does. Lately he asked if I could use some oleander trimmings he was about to have from an upcoming job. He said he would have a lot of them. Boy he wasn’t kidding. He stacked them on rugs that were there for weed abatement. As I distributed them, I moved the rugs farther down in front of the fence for the back yard. The hope is to plant the #AlleywayProject and the #ParkwayProject for a #FoodIsFree thing. Why not plant anything that can be. I read online that oleander breaks down quickly. We’ll see. Most of the soil here is VERY sandy. I’d like to plant grapevines all along the fence for more privacy as well as food. I lopped this debris as I went along. Still more lopping can be done and will be as time goes by. For now, the blister on my palm forced me to quit. A chipper/shredder would be wonderful, but is that sustainable? You can see by the time stamps on the images that it took me a little over 2 hours from the piles to where it was distributed and lopped. It was good exercise as well. We don’t have to have expensive, gas-using things to do the job where a little patience and fortitude can do the same thing; #VoluntaryRadicalSimplicity. The dead wood will be used too. Possibly a new Hugelkultur mound somewhere, maybe even where it is. It was too hard to lop. Works better to break it up by hand. I got hungry and ran out of steam at this point. The goal here at First Do No Harm Front Yard Farmacy is to use it up, wear it out, make it do, or do without. And commission as many old, worn out, on-their-last-leg things into the equation as possible. I placed an ad in our local trader lately and it is working like a charm. This is just a fraction of the tiles one man has for me. I’ll go back for more as he gets them out to where I can easily access them. What a fun way to meet people too. Another lady called and will bring a load of hers to me in December, her next trip into town. I’m inching my way to the place I want to be. This Thanksgiving I will spend with my vagabond friend, scaring up whatever we can for a nice meal. We often go out scouting for an off the way place open on Thanksgiving Day to commune with others who don’t have large families or other options. This year, I don’t want to leave Little Red-Haired Girl for any length of time. Nothing like a home full of animals anyway. Hope you all have a radically simple, sustainable Happy Thanksgiving as well. No turkeys will be harmed on this ‘farm’. Oleander contains highly toxic glycosides, and the branches or leaves left over after oleander shrubs have been dug out or pruned should be disposed of properly. Instead of discarding them in your trash, compost the oleander. This safely dispels the toxins and recycles the oleander waste material into a rich garden amendment that can feed your vegetables, flowers and shrubs. days, it was undetectable in compost. oleandrin was detected in any lettuce plants (Table 1). Tomatoes required longer to grow and produce a crop. same vines were subsequently eaten without harm. is not transported into plants. My mind tumbled for quite awhile last night trying to figure out how to continue taking advantage of this debris. Possibly dig a trench and bury it? Pile it higher along the fence footer and barricade it with stakes and cardboard? Any suggestions? sfgate.com had this to say; which contradicts above study. They cited no studies. I just watched the remake of Alfie, with Jude Law, (checked out at the library). Boy is he hard to look at, ha! There have been some hair-raising goings-on outside the castle at Elsinore. As the terrified Horatio and Marcellus look on, the ghost of the recently deceased king appears to Prince Hamlet. The spirit beckons Hamlet offstage, and the frenzied prince follows after, ordering the witnesses to stay put. They quickly decide to tag along anyway—it’s not “fit” to obey someone who is in such a desperate state. Every day fear seems to be escalating and many people seem to be falling into despair. I have to say that I am alarmed at what is happening myself, but I quell my fear quickly because I KNOW that we all have MUCH more power than we let ourselves believe we do. We also have much more control over just how this all may effect us on a personal level. Yes, if ‘The Commons’ are privatized and those who seek only wealth have their say, we are probably doomed, we may already be and this will just escalate it; only though, I believe, because we are not personally willing to adopt lifestyles that could very likely put a halt to this awful scenario. I have been tagging all my comments with #VoluntaryRadicalSimplicity because I think it is akin to boycotting businesses/corporations/TPTB – on steriods. Without the demand for the things that are commodified so that stocks can be sold to gamble, what real power would ‘they’ have over us? Seems to me that most of our troubles are the result of the fantasy that we can all be rich and can ALL have EVERYTHING. What seems to be at the base of wanting the latest, greatest is personal insecurity with who one is within society at large. Alfie seemed to have been having the same dilemma. It was soon revealed that he was stifling his emotions and that at the core of his ‘womanizing’, he was insecure; difficult to fathom. How hard it must be to be that beautiful and not know why people like you. Nature volunteering simplicity with elegance; Brassicas popping up all over. Protecting the Brassica volunteers from The Powers That Be…Nature/Nemesis White Butterflies; chicken wire tents. As a young girl, I was often alone because I was just simply overwhelmed with trying to manage all of the feelings that are part of interacting with another or others, probably because of a very dysfunctional family situation. To content myself, I would go out into the fields around our house, which were many in the 50’s and 60’s, and create ‘communities’ by dragging things over the ground to make ‘city’ plots. I spent hours doing it, all by myself, and loved it. What I do now is not much different and for very much the same reasons, only now I create plots to grow food. I’m 62 now and it took me many years to get to this lifestyle of progressively increasing #VoluntaryRadicalSimplicity. The longest I stayed at any place of employment was 7 years. It finally became clear to me that I didn’t agree with most of what was going on. I finally found that nothing I was doing was in line with my core values; there was always some kind of compromise involved and it was leaving my soul bankrupt. I was actually getting physically sick. So, I set out to be my own employer. When that also became too much compromising, I adopted this lifestyle. It’s not for everyone, but it was perfect for me. Hibiscus going to sleep/ cycles of life. It reminded me that we all don’t have to have it all. I don’t have enough resources on site, yet, to do all of the things I hope to do. My neighbor recently delivered the above pictured trimmings from a job he did. He has given me things (debris) from his own yard before and is now coming to me to ask whether or not I can utilize certain things. He has another job coming up which will yield a large amount of Oleander trimmings and he came inquiring whether or not it is allelopathic and could I use it? I quickly came in to investigate it and found that it IS toxic, but that the toxicity is virtually eliminated during aerobic composting. It is NOT allelopathic. He will deliver that too and was delighted that I would take it. Saves him a fee at the dump and he is in full support of a neighbor growing food; win win. We’re going to put it in the #AlleywayProject. It is toxic to small animals who might eat it. It is toxic to humans in that it irritates the skin to touch it. What a great stride for my goals to plant the alley. #CommunityIsThenewNewDeal. Our best hope is in each other, don’t you think? I have no idea what political persuasion my neighbor is. It doesn’t interfere with us getting along. His ex-wife, that’s another story, (we got off to a rough start when I first moved here and put up the fence between our yards). We evolved. The changes I’m seeing in the World are that we are finally talking about things in a meaningful way. We don’t have to limit ourselves to the powers that be; we have our own and they are rather Super. Not anything like nature’s though.